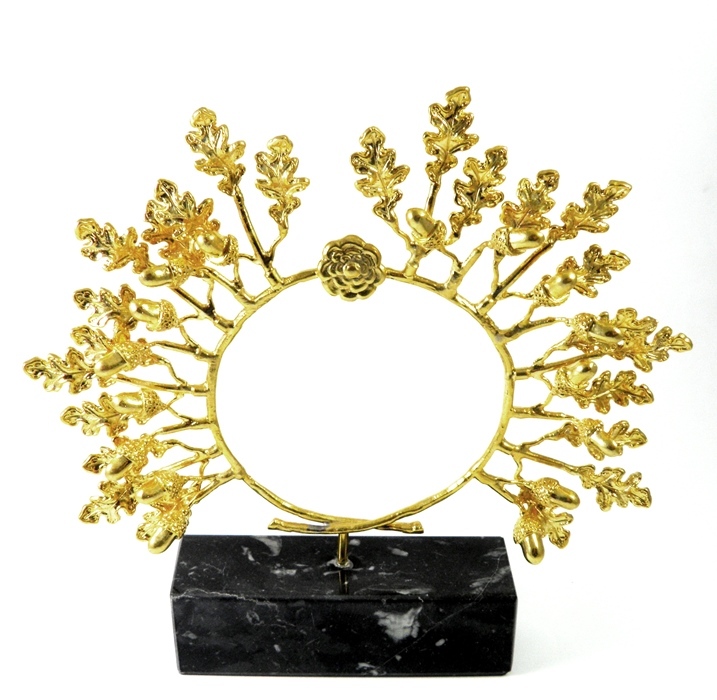 The wreath is inspired by the golden oak wreath, that was found at the tomb of king Philip II of Macedon, in the city of Vergina in Greece and dates to the 4th century B.C. When found it consisted of 313 oak leaves and 68 acorns. The oak was the sacred tree of Zeus and oak wreaths were often found in ancient royal tombs in Macedonia and Asia Minor. 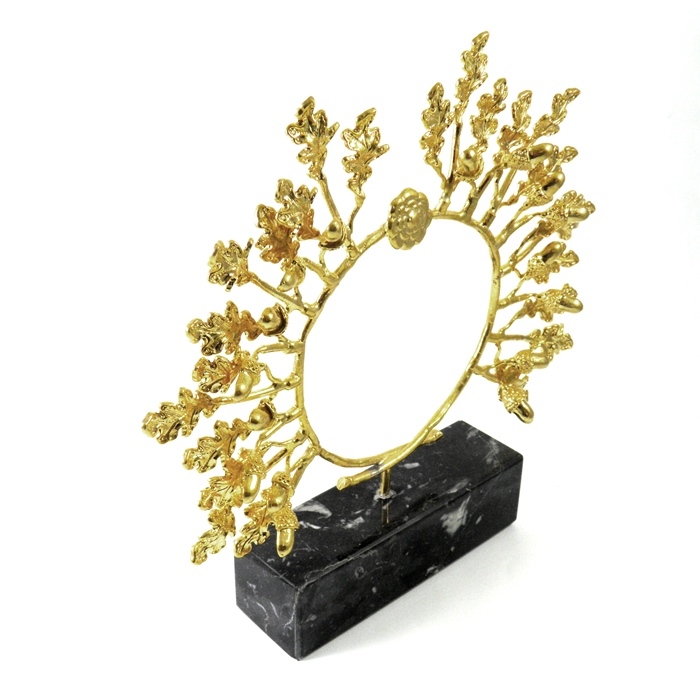 Our wreath is handmade of 24K gold-plated brass and mounted on a marble base.A unique oak wreath in free rendering, woven by hand and decorated with oak leaves and acorns. The golden oak wreath was discovered by the Greek archaeologist Manolis Andronikos at the tomb of Philip II of Macedon, which consists of two rooms. The wreath was found inside an urn, along with the king's burnt bones. The funeral of Philip II in 336 BC was performed in Aigai. The tomb is located at Vergina, a small town 75 km. southwest of Thessaloniki. Evidently, the dead king wore the wreath during the cremation and as the fire consumed his body, the wreath underwent some changes, especially at the central part. The crown, which now consists of 313 oak leaves and 68 acorns, is an elaborate artwork, that mimics convincingly the twigs and the acorns of the oak, which was the sacred tree of Zeus. The wreath, which weighted 717 grams, is not only one of the bigger and the heavier golden wreaths that are saved, but also one of the most precious wreaths, which were ever manufactured. The wreath is displayed at the Museum of Royal Tombs of Aigai, at Vergina.